The Fullerton Prostate Forum has a large video library on prostate cancer and related subjects. We have selected the best of these and make them available to support groups and individuals who need them. These videos were made by Lew Pfeffer, a 15 year survivor and currently the Chairman of the Fullerton Prostate Forum. It should be noted that these videos were made using a digital video camera and are available on DVD. They are not studio quality, but we believe they contain a lot of valuable information that is not readily available to most prostate cancer patients. 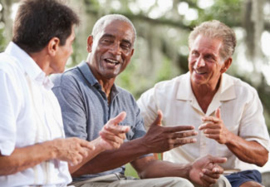 Consider using one of these videos as the program for a prostate cancer support group meeting. A list of these videos is now available on our web site at: www.prostateforum.org. Just click on “videos”. 404 “Controlling Advanced Prostate Cancer” by Dr. “Bob” Leibowitz, MD and Medical Oncologist from the Compassionate Oncology Group in Los Angeles, CA speaking at the Fullerton Prostate Forum on March 27, 2007. – 2 hours. 406. “Emerging Radiation Technologies” by Oscar Streeter, MD and Associate Professor from USC speaking at the Fullerton Prostate Forum on June 27, 2007. 408. “MRSI (Magnetic Resonance Spectroscopy Imaging) of the Prostate” by Susan Nowolski of UC San Francisco speaking at he Fullerton Prostate forum on July 24, 2007. 110 minutes. 409. “Staging and Treatment of Newly Diagnosed Prostate Cancer” by Mark Scholz, MD and Medical Oncologist from Marina del Rey, CA speaking at the Fullerton Prostate Forum on August 28, 2007. 2 hours. (This is an outstanding video – we give a copy to each of our newly diagnosed men). 415. “Focal Therapy for Prostate Cancer Using Cryotherapy or HIFU (High Intensity Focused Ultrasound)” by Douglas Chinn, MD from Arcadia, CA speaking at the Fullerton Prostate forum on January 24, 2008. 70 minutes. 416. “Prostatitis” by Leland Ronningen, MD and Asst. Clinical Professor at UCI Department of Urology speaking at the Fullerton Prostate Forum on February 28, 2008. 72 minutes. 417. “Permanent Radioactive Seeds for Prostate Cancer” by Stephen Doggett, MD from Tustin, CA speaking at the Fullerton Prostate Forum on March 27, 2008. 65 minutes. 418. “Open Radical Prostatectomy for Prostate Cancer in 2008” by Elia Skinner, MD from USC Medical Hospital speaking at the Fullerton Prostate Forum on April 27, 2008. 421. “Ten Prostate Cancer Survivors Tell Their Stories” at the Fullerton Prostate Forum on May 22, 2008. 105 minutes. 422. “Male Osteoporosis” by Stephen Strum, MD from Ashland Oregon speaking at the Fullerton Prostate Forum on June 26, 2008. 105 minutes. 424. “Recover Potency and/or Urinary Control” by Dr. Galen Bird and Linda Bird from Missouri speaking at the Fullerton Prostate forum on September 25, 2008. 90 minutes. The cost of each video is $15.00 including shipping by priority mail to any address in the 50 United States. Please make your personal check or money order payable to Lew Pfeffer and mail to 1250 Fieldgate Ave., Hacienda Heights, CA 91745. For orders from other countries, please send an international money order for $10 plus the cost of airmailing a 5 ounce package. Payment to be in US Dollars. Please include the Title and Number of the videos you order. We hope that this information will be helpful to you or someone you know.